WWII STYLE Stainless Steel Canteen Cup With Vented LID for 1 QT. Canteen. by G.A.K at Kerinci. MPN: LYSB01BX28NBQ-SPRTSEQIP. Hurry! Limited time offer. Offer valid only while supplies last. WWII STYLE STAINLESS STEEL CANTEEN CUP WITH VERTICALLY FOLDABLE HANDLE WITH VENTED LID FOR 1 QT. CANTEEN. BRAND NEW IMPORT, BRUSHED MATTE FINISH. 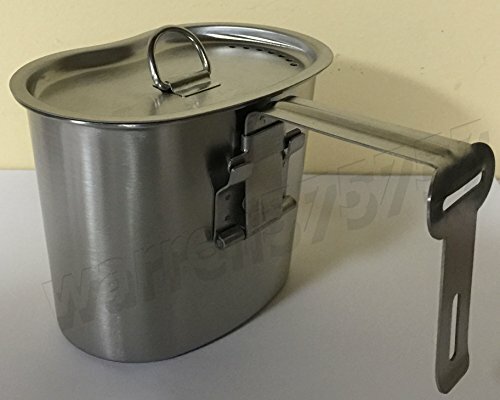 WWII STYLE STAINLESS STEEL CANTEEN CUP WITH VERTICALLY FOLDABLE HANDLE WITH VENTED LID FOR 1 QT. CANTEEN. BRAND NEW IMPORT, BRUSHED MATTE FINISH. PLEASE BE ADVISED THAT THE CANTEEN CUPS DO NOT FIT WITH ALL STANDARD G.I. CANTEENS. International Buyers- Please note Import duties, taxes, and charges are not included in the item price or shipping. These charges are the buyer's responsibility. Please check with your county's customs office to determine What these additional costs will be prior to bidding or buying. PLEASE BE ADVISED THAT THE CANTEEN CUPS DO NOT FIT WITH ALL STANDARED GI CANTEENS.